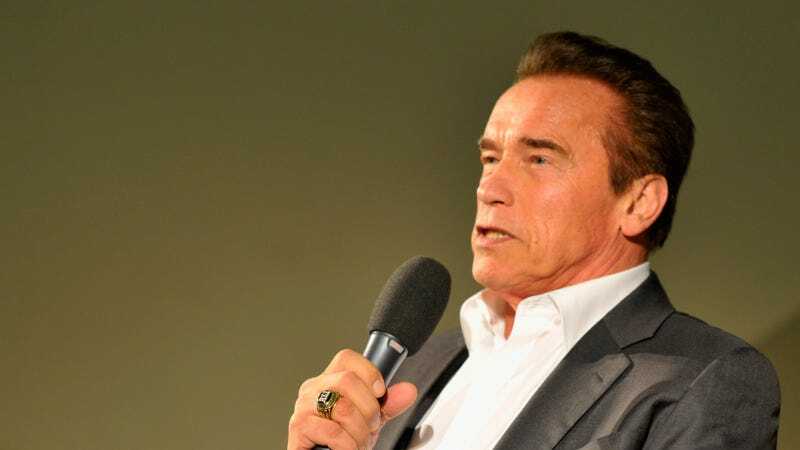 Arnold Schwarzenegger, former body-builder, former governor, current movie star, haver of a secret family and ultimate embodiment of the American Dream, has some thoughts on climate change. And they are actually quite lucid. Each and every time I post on my Facebook page or tweet about my crusade for a clean energy future… There are always a few of you, asking why we should care about the temperature rising, or questioning the science of climate change. I want you to know that I hear you. Even those of you who say renewable energy is a conspiracy. Even those who say climate change is a hoax. Even those of you who use four letter words. Schwarzenegger added that he has some questions of his own for the climate change deniers trolling his social media posts. First, he sets up a scenario where they are indeed correct on the science ("Let's put climate change aside for a minute. In fact, let's assume you're right.") and then he asks: "Do you believe it is acceptable that 7 million people die every year from pollution?… do you believe coal and oil will be the fuels of the future?…"
I don't want to be like the last horse and buggy salesman who was holding out as cars took over the roads. I don't want to be the last investor in Blockbuster as Netflix emerged. That's exactly what is going to happen to fossil fuels. There are two doors. Behind Door Number One is a completely sealed room, with a regular, gasoline-fueled car. Behind Door Number Two is an identical, completely sealed room, with an electric car. Both engines are running full blast. I want you to pick a door to open, and enter the room and shut the door behind you. You have to stay in the room you choose for one hour. You cannot turn off the engine. You do not get a gas mask. Effectively, Schwarzenegger is saying that regardless of the science on climate change, pollution is real. And people who oppose his clean energy efforts are cool with death and not cool with movie streaming services. Sick burns, all around.